The debut REGROOVED CANADA party on January 30th was a huge success, and the folks at GROUNDED TV caught it all on tape! Get a glimpse of Vancouver's fledgeling Nu Funk scene in action, including live performances by MC THINK TANK and ERICA DEE with The Funk Hunters, Stickybuds, J-Roc and myself on the decks. Interviews with the whole crew as well. My tune "Hustle Muscle" has been ripping up the Nu Funk scene since last summer, with support from Parker, Sly Players, Featurecast, Slynk, Stickybuds, Basement Freaks and more! 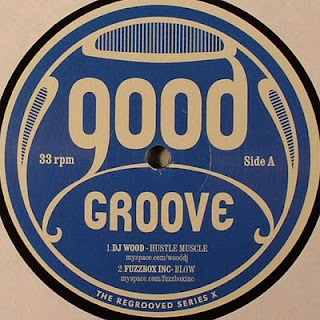 It's now available from Goodgroove Records on 12" vinyl, alonside 3 more sure fire bombs from 3 artists making their Goodgroove debut: J-Roc (Soul'd Out DJs), Philly Blunt and Fuzzbox Inc. Order your copy now from Juno Records! Hello all, and welcome to my new web site! Check here for the latest info on shows, tunes, mixtapes and more. Be sure and explore the rest of the site as well.